For Over 25 years, SignPros continues to build on its commitment to high standards with cutting edge sign design, innovative sign fabrication and friendly service. SignPros is headquartered in Glendora, New Jersey, in a newly renovated 10,000 sq. ft. state of the art sign facility. We are strategically positioned is Southern New Jersey, just minutes from Philadelphia and close to Delaware and the Jersey Shore. SignPros services customers up and down the Northeast Corridor. 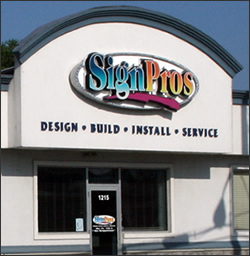 SignPros Clients range from small, start-up entrepreneurs, commercial and residential developers to national sign providers. In addition, SignPros specializes in creating exciting exterior environments for restaurants, small chains and shopping centers. Whatever your signage needs might be, SignPros is ready to customize your ideas and create the look you envision. After browsing the gallery of our latest sign work, contact our experienced staff and find out how SignPros can create a sign for you! Do you need signs and visual graphics? We're here to help! Drop us a line, and we'll get back to you with a price quote.